My Pet began in 1991 in Mathoura, a small country town in NSW, when a dear little Jack Russell called Tuppy, shivvered so much it seemed the right thing to do to let my sewing training, skills and experience (TAFE Fashion Certificate) finally "go to the dogs!" Originally starting at local markets, business grew and grew. Now My Pet supplies Pet Shops, Vets, Businesses, Government (Customs, AFP, Border Security, Police and others); as well as the General Public via our Internet websites at www.mypet.net.au and www.doghats.com.au with a delightful selection of dog hats, coats, clothing, accessories, and other dog supplies. Our My Pet and Bones-R-Dry brands are made in Australia by myself and ladies with a huge love of dogs and a passion for quality sewing. Indeed, we are now so busy sewing for dogs at My Pet, there is rarely any time left for sewing for people! But then, dogs are NEARLY people to us anyway! Now located in Albury, NSW we look forward to helping pet people everywhere. and Bindi, our dear little model, in her Camouflage jumper. 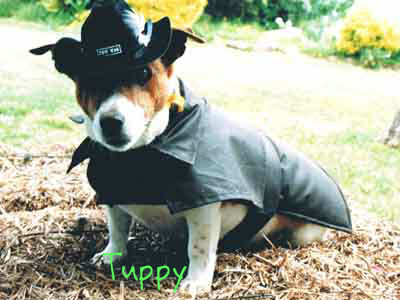 Tuppy and Bindi faithfully endured many sessions of fittings and helped with trials of new designs to determine the most comfortable fitting for dogs everywhere. They seemed to know they had an important role in the business as they modelled at markets and fairs!